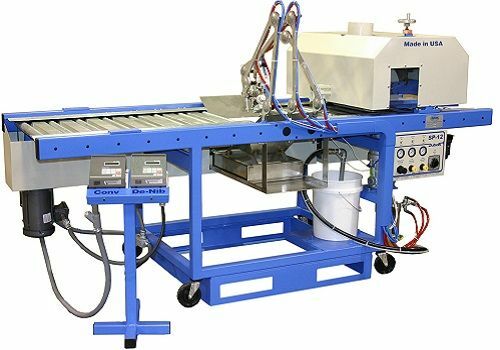 The DuBois SP-12 is a high-quality, portable solution that provides the most economical and efficient process to apply coatings to molding and other lineal products. The SP-12 is mobile and designed to be operated in the front of a ventilated spray booth during coating operations so any vapors will be collected and discharged through your booth exhaust system. It can be supplied with an independently controlled sanding unit for de-nibbing the dried seal coat immediately before topcoat application. The DuBois SP-12 lineal spray machine comes outfitted with three air-assisted airless spray guns and a supply pump with regulators, fluid filter, and all necessary hoses, fittings and connections for a complete working system. The air-assisted airless spray guns offer the highest transfer efficiency today and will cut your coating costs dramatically versus hand spraying with HVLP or airless spray guns. We can also provide a Technical Services technician to meet your SP-12 when it arrives at your facility to assist you with installation, start up, operator training and maintenance procedures. Contact Finishing Consultants for customer references, pricing or additional information. For more product information for the DuBois SP-12, click here. Schedule a visit to day so we can help you optimize your wood molding or lineal finishing system.